If you’re considering creating an eyewear line, eyewear designer Sandra Battistel shares her wealth of advice and experience with these top tips. The great thing about eyewear is that it’s a mix of fashion and product design, and one of the best examples as to how these two disciplines work together. It also plays a big part in defining one’s personality, so this adds another dimension to such an amazing product. There are a lot of independent brands emerging so it’s important to create innovative designs and concepts if you want to stand out. My first recommendation would be to get a solid understanding of the manufacturing process and the materials used: acetate, wood, lens, metal plating, etc. The best way to do this is to work closely with a manufacturer. Spend as much time on the production floor as you can and get in-depth explanations of each step of the process, or partner up with an experienced product developer. This will inform your designs and also give you the foundations to work with new materials and new techniques and processes, if your desire is to innovate. My next recommendation, in a way, contradicts the above. 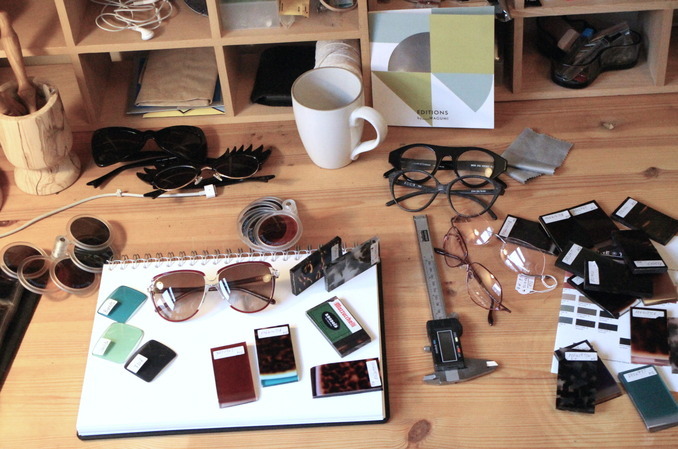 You don’t need to be an eyewear designer to create a successful eyewear line or brand. Eyewear’s saving grace is that you cannot actually study eyewear design as a Degree so most designers come to eyewear from various disciplines and backgrounds: art, furniture design, photography and styling, for example. This brings a fresh approach and new ideas to the development of the product. I see a lot of standard eyewear around, and the most successful brands are the ones that create something new, either through innovative materials or designs. However, there is a fine line between creating something completely crazy for design’s sake, and something new and desirable, yet wearable. So, it’s important to get the balance right. Attention to detail is imperative. Eyewear is a small item, if compared to other accessories such as handbags and shoes, this means that small changes make a big difference to the design and overall proportions of the product. Normally variations and adjustments to size and design are in the range of millimetres. Learning to observe people’s features and face shapes will help create a product that fits, and this will seal the success of your designs. I have a real fascination with people’s faces and often catch myself wondering what eyewear would fit someone when I first meet them. Though it is essential to follow fit standards, I think it’s important not to be too restrictive; even an exaggeratedly big pair of glasses can define someone’s personality. The important thing is that they don’t fall off the face or that they are not too tight, as this can cause migraines. Lastly, spend a lot of time researching how an eyewear line will reflect your brand identity or how it will complement the rest of your accessories range. I would advise not to create direct replicas of vintage eyewear, or create versions of what other eyewear brands are doing. Though these can serve as inspiration, I would also look at other products like jewellery and architecture for ideas. For more eyewear line inspiration, visit Sandra’s blog, EyeSpectacle.